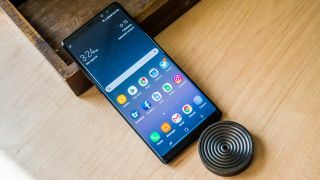 The Samsung Galaxy Note 9 will be announced on Thursday, August 9, according to a new report today that also details the specs of the next big Android smartphone. In a little over two months, you'll get your first glimpse of it at Samsung Unpacked in New York City, says Bloomberg, suggesting the big highlight is a camera upgrade. Today's report also mentions an 'upgraded processor from Qualcomm for some markets'. Don't read too much into that. It's still likely using the Snapdragon 845. The Snapdragon 845 is the same chip found Galaxy S9 and Galaxy S9 Plus, an 'upgrade' over the Snapdragon 835 in the Note 8. We don't expect a new Qualcomm chip here. Yes, there is a rumored Snapdragon 850, but the reports there say to be tweaked for Windows computers, and it likely too soon for the Snapdragon 855 chip, slated for the Samsung Galaxy X. The Note 9 camera may be in the same 'upgrade' boat – better than the Note 8, but still roughly the picture-taking experience you get on the Galaxy S9. The language of the report is rather vague on everything but the launch date. Samsung's new phones can display Mobile HDR video (seen above), but can't capture it. The Note 9 could change that. There's one difference we can foresee: several Android phones are now capable of HDR video recording, including the Sony Xperia XZ2 and LG G7. That feature was unceremoniously cut from the Galaxy S9 and Galaxy S9 Plus. Why? Specifically because Samsung's Exynos 9810 chip (used outside of the US and China) isn't capable of HDR video recording. The feature was therefore turned off on the versions of the S9 with the Qualcomm Snapdragon 845 chip, too, likely for the sake of feature parity across the globe. Phones with HDR video recording can soak up 64 times the color data compared to standard sensors, going from 8 bits of color to 10 bits of color. The expanded color spectrum can liven up videos, and Samsung's Note 9 could be next to get it. We'll know for sure on August 9, apparently, where TechRadar will report on Note 9 live from Samsung's Unpacked event in New York.